The Summer Learning Academy (SLA) is a bridge program for invited incoming 9th grade Rising Scholars. The Summer Learning Academy has three foci: math, ELA and soft skills/team-building. This is an opportunity for students to meet and network with their individual building cohort and their larger cohort as they move into their freshman year. Transportation is NOT provided. Snack IS provided. SLA is highly suggested but NOT mandatory. 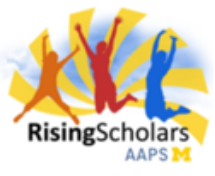 SLA is taught by AAPS high school teachers and University of Michigan, CEO mentors/tutors. Students do not need to bring any school supplies to SLA.